There is an ongoing debate whether conservatives or liberals are more fiscally responsible. This is a difficult question to answer at the national level, where so many different factors come into play: the President, the party controlling the House and Senate, the incoming economic situation, unforeseen and unpredictable current events, natural business cycles, policies that cross party affiliations, and the difference between campaign rhetoric and actual policy actions, among other things. It’s a debate that has been and will continue to rage for years, shifting back and forth with every election. But if we examine financial performance at the state level, we have 50 different examples (plus the District of Columbia), which can give us a far greater potential insight. To do so, we’ll rank all states by Obama’s vote margin percentage in the 2008 election. This will rank each state from the one that has the highest concentration of liberal voters (the most liberal state) to the one that has lowest concentration of liberal voters (i.e. the most conservative state). 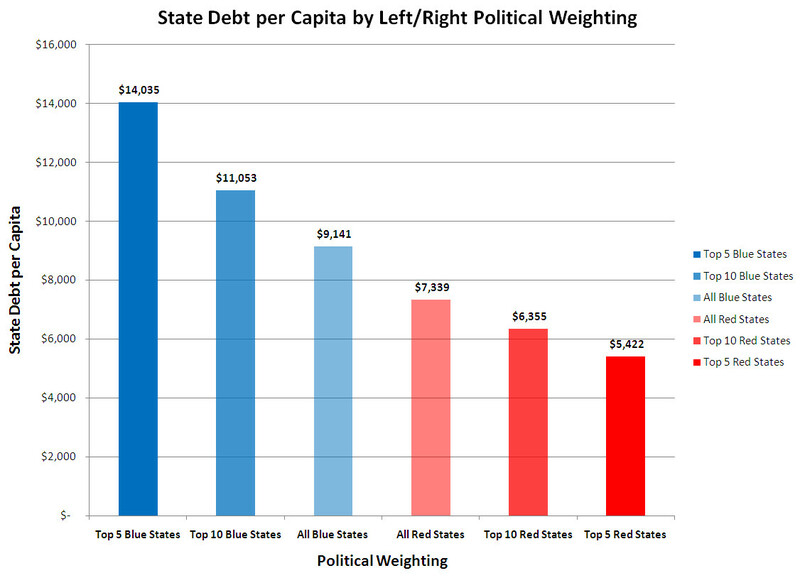 Then we’ll compare that ranking to each state’s debt per capita to determine the degree of fiscal responsibility. Debt per capita takes into account each state’s policy decisions on both taxation (revenues) and spending, for an effective measure of how well the state’s finances are managed for long-term sustainability. 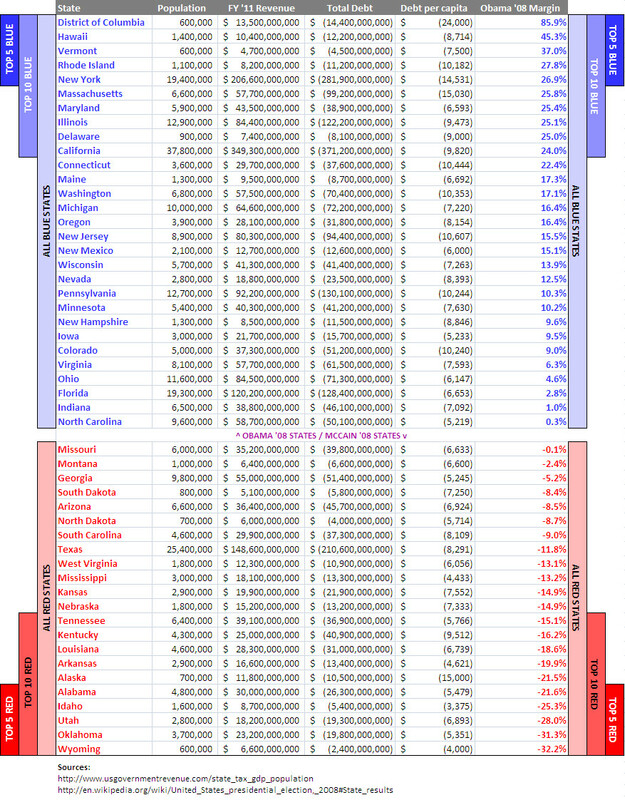 There is, without question, a clear and unambiguous pattern: the more liberal a state’s voter concentration, the more indebted and fiscally irresponsible its finances (the top 5 most liberal states have $14K in debt per capita), while the more conservative a state is, the more fiscally responsible (the top 5 most conservative states have $5.4K debt per capita, or one third as much as the most liberal states). In other words, the amount of conservative voters in any given state is directly proportional to its successful financial management. And the more liberal voters there are, the more irresponsible the spending and financial situation. Given the clear difference between the two when measured across the 50 states, if the goal is fiscal responsibility and balanced budgets, the lesson is to follow the counsel and successful track record of conservative voters. The amount of debt alone does not indicate fiscal irresponsibility. A corporation with zero debt is generally a bad investment, as is one that can barely make its payments, so we can’t know if conservative states have too little debt or if liberal states have too much. We need to compare the state’s net worth and income to its debt load in order to make a reasonable decision about the state’s fiscal responsibility. Why? A state is not an investment. The only additional measure that’s important is net median income growth over time, as a measure of directional standard of living improvements. But that’s another analysis for another time, and keep in mind that current debt load subtracts from future income, since debt is simply a tax deferred from the present to the future. A state is no different than a corporation with a CEO (president, dictator, king) and a board of directors (senate, congress, noblemen), except that a government has the right to use lethal force. If cities and states were not run by governments, would not private land owners create private cities on their land, and charge rent (property tax) to live there?